Classic Wonder Woman comic art with resilient protection. authentic DC original patterns for any device. Cases & skins featuring the fastest man alive. Full color superhero portraits + official DC logo wordmark. WHETHER YOU'RE INTO CLASSIC BATMAN OR IF THE JOKER IS MORE YOUR STYLE, WE HAVE CASES AND SKINS FOR ALL YOUR FAVORITE HEROIC DC COMICS CHARACTERS. SELECT YOUR FAVORITE SUPERHERO AND CHOOSE THE DESIGN THAT BEST SUITS YOUR PERSONAL STYLE. DC Comics and Skinit have united to deliver you original and limited edition phone cases and decal skins for an authentic comic-book style. 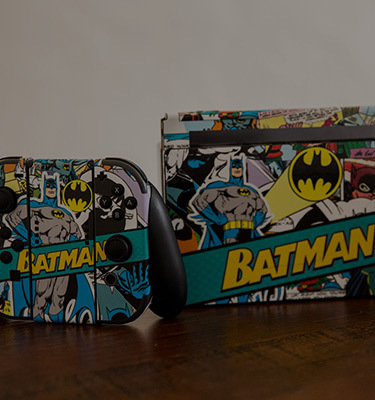 From Batman iPhone cases to The Joker PS4 Skins, Skinit offers official DC Comics designs for any phone, laptop, tablet, gaming or audio device. Choose wisely and show off your DC Comics style with #Skinitmade.